Sew It, Grow It, Show It – Sell It, Teach It? 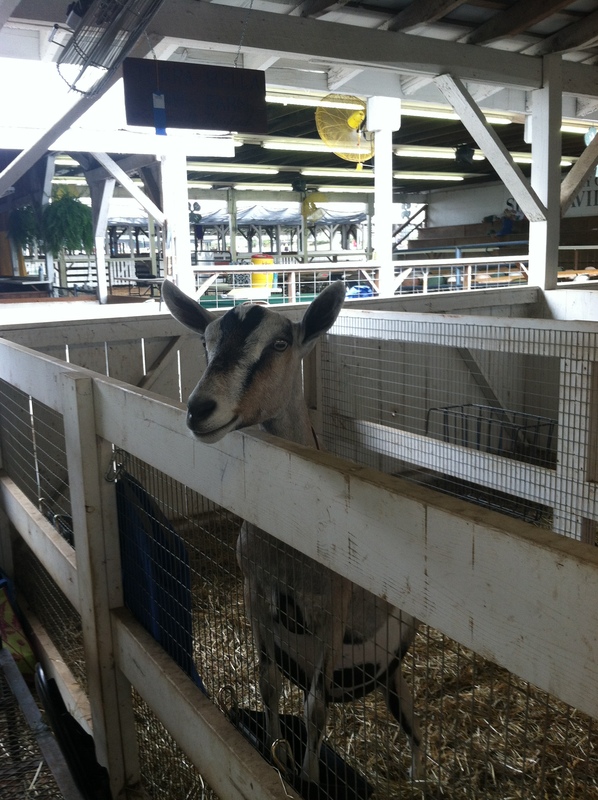 County fairs are good, old-fashioned fun in the very best way. Fried and fresh food, animals, and rides that spin you round and round have timeless charm. That’s why we made our way back to the Montgomery County Agricultural Fair , which this year had the slogan, “Sew It, Grow It, Show It.” While last year I described how the county fair highlights the bounty of Montgomery County’s Agricultural Reserve, this time around I considered how it can contribute further to building our local foodshed. After all, you can only watch so many pig races! This year, I was happy to see an increase in the number of local producers selling products, even though the numbers were still small. In the past, I was disappointed to learn that the Big Cheese booth only carried Wisconsin cheddar. Considering the plethora of cows and goats in the nearby pavilions, this seemed like a vast oversight. I was pleasantly surprised this year to find out that they were offering local goat cheese as well as cheddar that had sold out by the time we arrived. Now, we just need a locally sourced cheese carving contest! We bought some lush peaches from the Farmer’s Market section, but there were only two or three farms selling. In the Farm and Garden building, beekeepers were selling jars of honey and beeswax candles. The local business section had Boordy Vineyards representing our growing wine-making industry, but they were the only ones. We showed our support by purchasing a Riesling with a Baltimore oriole on the label – local wine, local wildlife! I don’t know if this goat produced milk for cheese, but it’s awful cute. In contrast to just a few vendors, I’d like to see a full spectrum of local food options. A good agricultural fair should have a bustling farmers’ market section with baskets of fruits and vegetables. While you don’t want to spin on the tilt-a-whirl with a bag full of rutabagas, the cheese stand and winery had a smart solution to this issue. They allowed buyers to label their goods, leave them at the stand, and pick them up later. The winery even had us write our phone number down so they could call us if we forgot. If there were a number of local vendors, you could have one central location to leave everything so you wouldn’t need to return to multiple stands. Similarly, I would like to have an expanded set of educational opportunities, especially hands-on ones. The Master Gardeners of Montgomery County had a lovely display of plants native to the Chesapeake Bay and surrounding regions. The folks manning the booth were quite available for questions, a fact I took advantage of. They even put on a few workshops during the week. Unfortunately, their booth had a serious lack of edible plants and as far as I could tell, none of the talks were on vegetable or fruit gardening. I would love to see a workshops about growing organic fruit or seed-starting on the schedule. As the people running the vegetable contest seemed disappointed in the number of entries, perhaps that could kick-start the next year’s competition! Wouldn’t you love to learn how to grow these suckers? The animal displays had a host of young 4Hers willing to talk about their goat or chicken – one little girl was particularly keen on showing off her wiggly poultry. But to get any information, you had to know what questions to ask in the first place. I think a series of presentations on raising chickens in suburbia would provide excellent public speaking experience for the future farmers and useful knowledge for the rest of us. That is an impressive chicken. 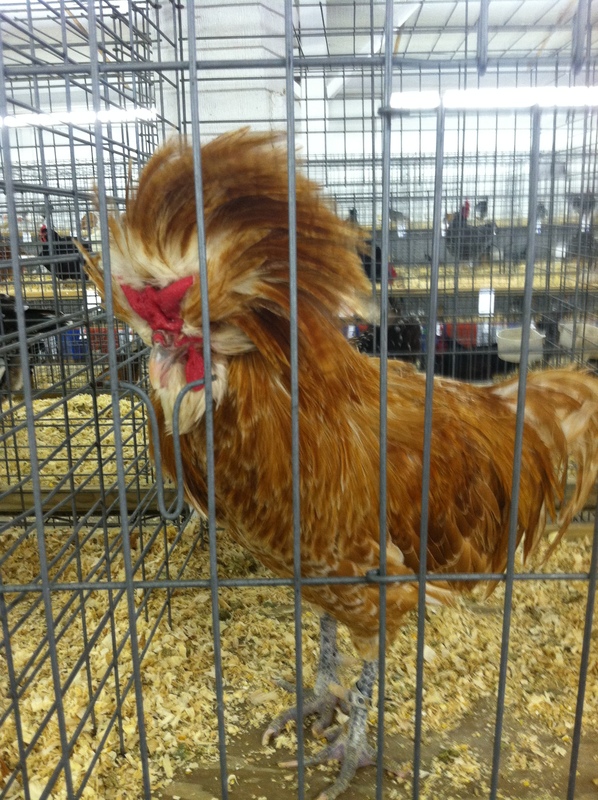 The agricultural fair serves many purposes – the ability to show off the results of hard labor, sharing of public services, and entertainment. But now more than ever, agricultural education is a key part of its mission. Fortunately, the spirit of fun engrained in the county fair is a great way to get people excited about the potential right their backyard all year long. 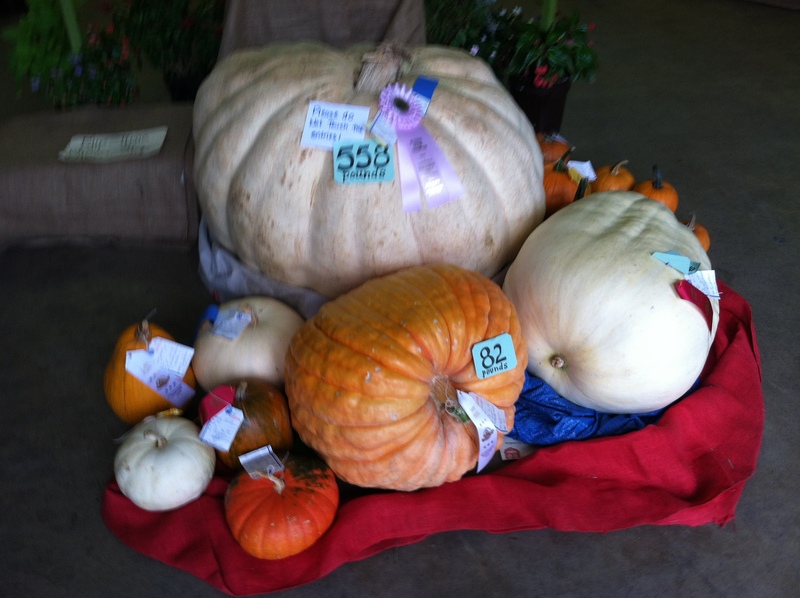 This entry was posted in community, food, gardening, MD and tagged agriculture, county fair, gardening, local food, Montgomery County. Bookmark the permalink. 3 Responses to Sew It, Grow It, Show It – Sell It, Teach It? I loved the local agricultural show when I was little in rural England. Luckily there are a few in West Australia similar enough to give me a trip down memory lane. Sigh, it’s inevitable I spend a lot of time looking at the baked goods! I didn’t know they had agricultural shows in the U.K. as well! I always thought it was an American thing. When I lived in England, the closest thing was a street carnival, but I didn’t live in a rural area. The one advantage of going at the end of the fair is that the baked goods are still pretty, but no longer edible.